Each February, the New York Pet Fashion Show — the largest pet fashion and animal rescue benefit in the country — returns to the historic Hotel Pennsylvania in Midtown Manhattan, kicking off New York Fashion Week and the Westminster Kennel Club Dog Show. 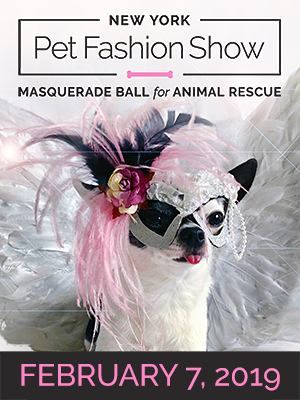 This fun annual event, co-chaired by pet fashion designer Ada Nieves and publisher and public relations professional Gregg Oehler, features themed costume runway shows with attendees' dogs (and other pets) walking the catwalk along with rescue dogs looking for homes. A Best in Show award is given for the best costume. The evening also includes the presentation of Golden Paw Awards to honor those who make a difference helping animals. 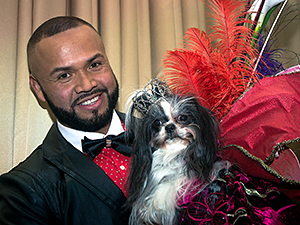 A portion of the event's proceeds are donated to the Mayor's Alliance for NYC's Animals. Join us in Hotel Pennsylvania's beautiful Penn Top Ballroom, overlooking the city and Madison Square Garden, for the New York Pet Fashion Show! Angels & Demons Couture – Who's Been Good and Who's Been Bad? International Masquerade Couture – What Mask Will You Wear? Have you ever dreamed of walking in a fashion show? We Invite you to walk with your pet in the Best in Show Contest for a chance to win prizes and gifts…or just come and enjoy! Each guest will receive a VIP gift bag, and is invited to enjoy complimentary food, music, cash bar, and vendor tables. A portion of the evening's proceeds will support the lifesaving programs of the Mayor's Alliance for NYC's Animals. All guests (and their pets) are encouraged to dress to impress. Tickets start at $50 for general admission, with limited tickets available for reserved seating, group tables, and "Best in Show" Costume Contest entries. You may purchase tickets online until 5:00 p.m. on February 5, 2019, or at the door (cash-only at the door, please).